This wall did not finish how I started it at all..lol. 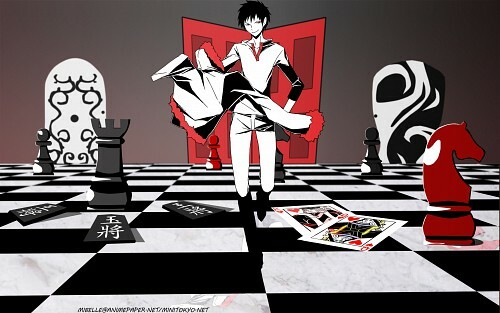 I originally wanted it to be a chess game and Izaya was a playing piece but to be honest I know not a thing about chess and when I came to the conclusion that I couldn't fit all the pieces on there I ran into the dilemma of not knowing which pieces to add and which could be left off or where to place them etc..So than it hit me, Izaya doesn't play real chess..lol. He's got his own crazy version he plays which involves chess pieces,shogi pieces,othello pieces and playing cards. I went and watched the episode where it shows him calling out who was each piece and set up the board similar to how he had his. Mikade,Kida and Anri are the 3 shogi king pieces,And Celty and Shizuo are the King and Queen of hearts. The rest are just pieces I threw on there to add to it. This was probably the most vectoring I've done on a wall and also my first wall using Photoshop. Aannd I think that's about it. Enjoy! Browse Izaya Orihara Gallery: Recent | Popular. Nice wall! I love the color scheme. :) I would have liked to see some more texture used, and the doors on either side of him look a bit choppy and not very smoothly outlined. Overall,though, good job! The vectoring looks a little rough (but not sure if that's intentional or not) though very interesting to see things get blurrier as they go further back away from him, very cool idea. I agree more textures would've been nice and spiced it up just a tad, but otherwise nice wallpaper ^-^ can't go wrong with Izaya~!